Without a doubt the leading South American fleet, the Armada de la República Argentina (Argentinian navy) played a significant role in the southern hemisphere, having the southernmost territories before the Antarctic. Moreover, the presence of the fleet at Cape Horn saved many lives, as it continues to do. But the true control of this “pacific gate”, the only one known before the digging of the Panama Canal, was the British naval base of the Falklands, which was reclaimed by Argentina in 1985 (see the Falklands War). The previous relations between the empire and Argentina, much too dependent on its massive exports to Albion, were in good shape. 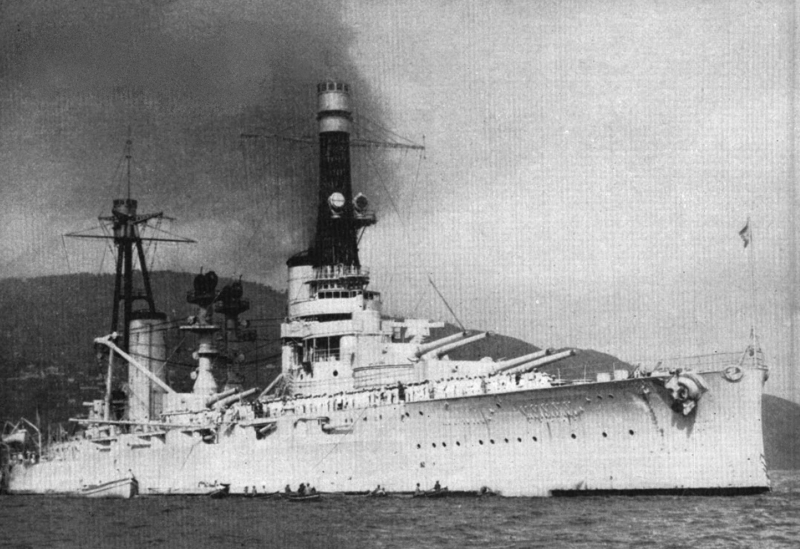 Rivadvia and Moreno were arguably the most powerful battleships in service in South America. However they went back to pre-ww1 and they had been not really modernized by the time of ww2. However, Argentina had been neutral in 1914, following the isolationist policy of the “big brother” of North America, but in open rivalry with its powerful neighbors, Brazil in the North, and Chile in the East. This superiority de facto in 1914, was going to be preserved until 1939, and Argentina became the most important ally of the USA in this part of the globe, notably because of this strategical position. By 1920, however, the fleet was totally out of date, with most of its units dating back to the 1880s and 1890s. 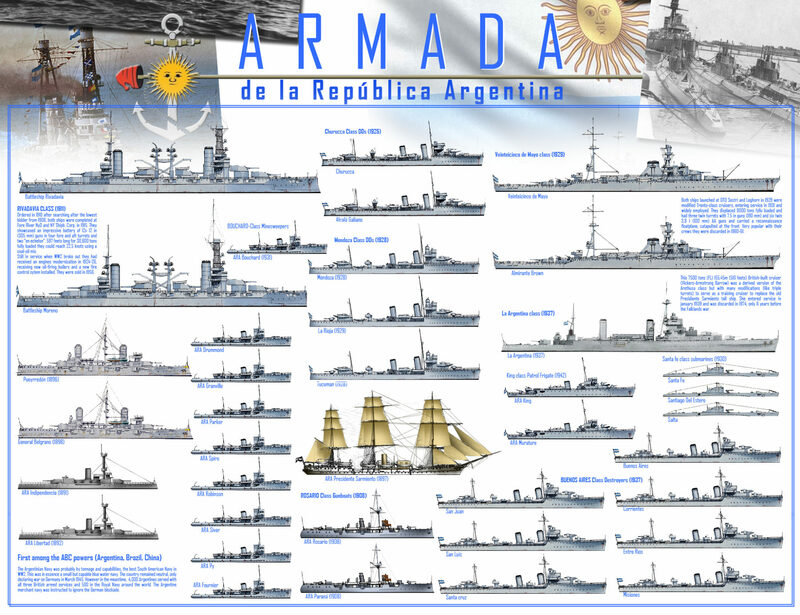 Only dreadnoughts Rivadavia and Moreno were relatively new. In 1924, as relations with Brazil deteriorated, a limited naval plan was adopted, given the capacity of Argentinian shipyards at this area, unable to build destroyers. This plan included modernization of the two US-built battleships, and in 1926, 75 million pesos were granted for a 10-year plan. 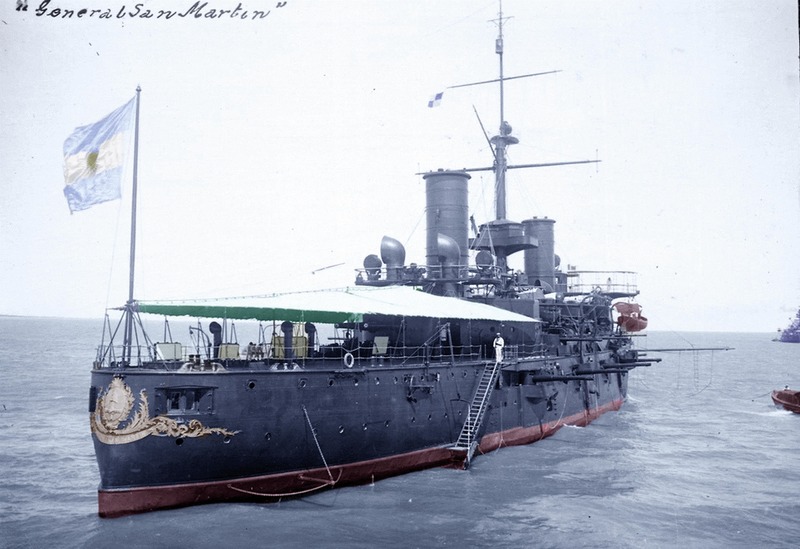 Armoured cruiser San Martin (colorized photo, ww1 era). Two of these former Italian armoured cruisers, possibly the best of their time, were still in service as second class coast guard cruisers. The first act of this plan included the acquisition of destroyers, in 1925, two to Spain (British model), then in 1928, 4 to Great Britain, and in 1936, 7 others of the “G” type. Commission began to tour yards to build the first Argentine submersibles (Brazil and Chile already had). The OTO and Tosi shipyards were eventually chosen, and received an order of 2 light cruisers (in 1926, Class Veinticinco de mayo) and 4 submersibles (Santa Fe class, in 1930). 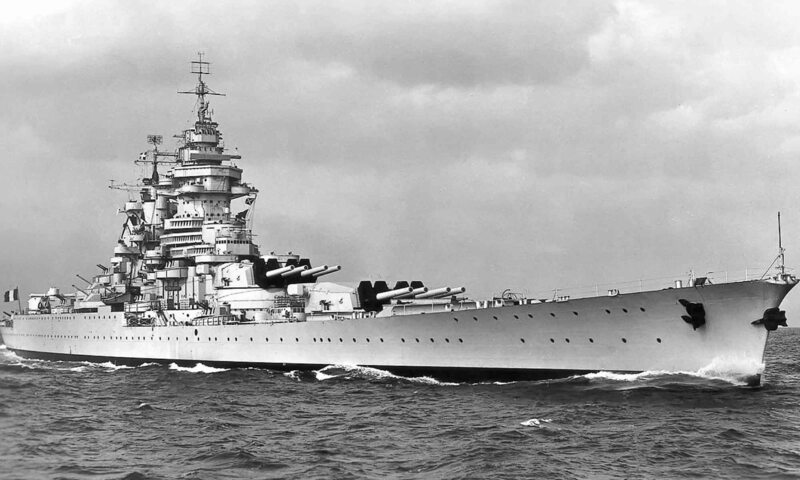 But in the late thirties, orders went to Britain rather than Italy, with a command of 7 destroyers and a cruiser. As soon as the construction yards of Rio de Santiago were able to do so, 9 minesweepers were started (Classe Bouchard, in 1935). 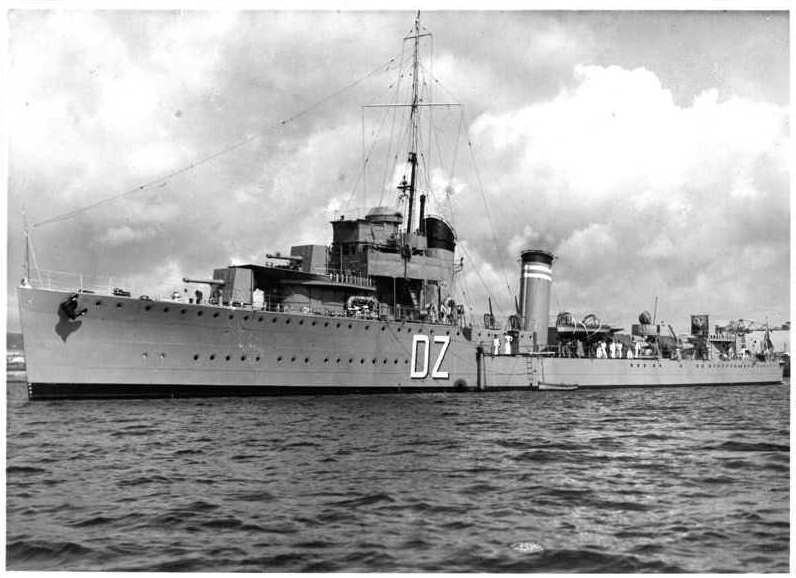 A little later, during the conflict, two patrol boats (hear frigates) joined the fleet in 1942. Argentina remained neutral for most of the conflict. His policy was confirmed when in 1939 Graf Spee fled to Montevideo, Paraguay, northeast of Buenos Aires. Yet it was an easy and quick opportunity to threaten the German Corsair. This country declared war on Germany only in 1945, but its military operations were limited to patrols in the South Atlantic. Get it and help support naval encyclopedia ! 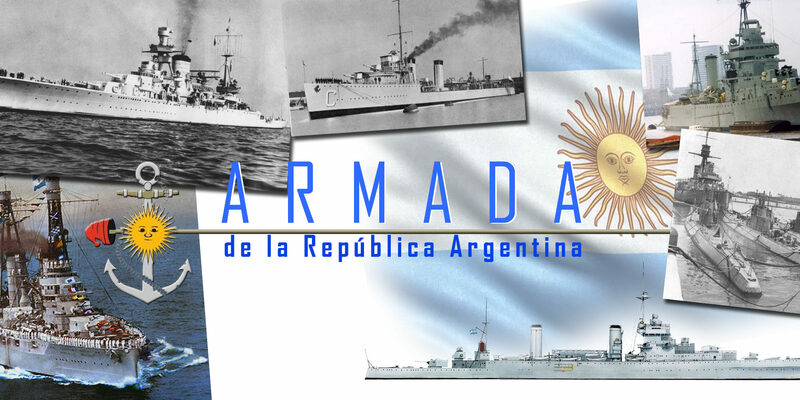 -Rivadavia: Certainly the two most important units of the Argentine fleet. Dreadnoughts dating from 1911 and built in the USA. Modernized in 1924-26 but old fashioned in 1939. – Class Veinticinco de mayo: Two modern light cruisers built in Italy, (1929), moving nearly 9,000 tons for a singular weapon (190 mm pieces). They were considered heavy cruisers within the Argentine Navy. – La Argentina: Lightweight cruiser built in Britain and issued in 1939. It also served as a training ship. – Class Garibaldi (Armored cruisers), two units built in Italy, dating from 1896-98. Virtually unchanged in 1939, they were relegated to second line cruisers. Two others of the same class had been scrapped in 1934-35. -Class La Plata: Two destroyers dating from 1911. 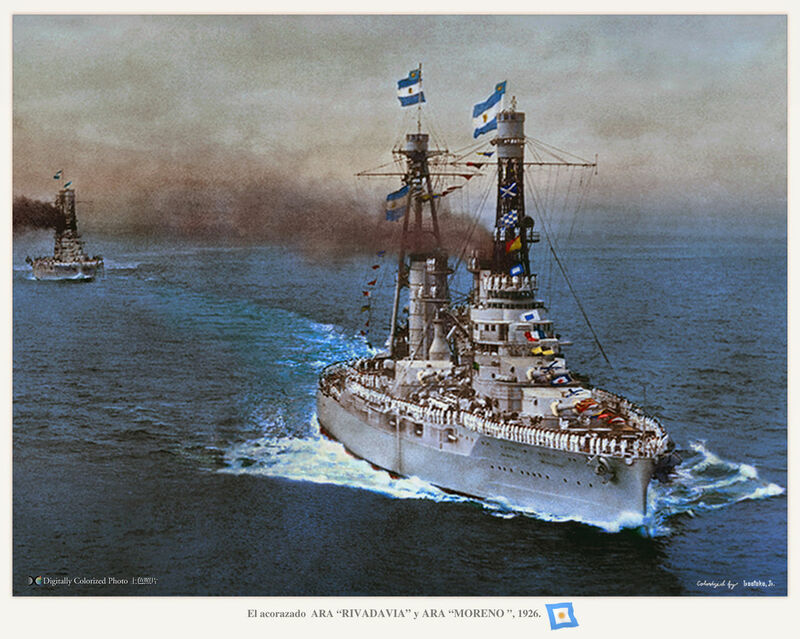 -Class Jujuy: Two destroyers dating from 1912. -Class Churucca: Two units of 1925. -Class Mendoza: 3 ships of 1928-29. -Class Buenos Aires: 7 ships of 1937, brand new. The spearhead of the Argentine Navy. -Classe Santa Fe (3 units, 1931-32). –King class frigates (2 units, 1943-45). Released in response to two impressive Minas Gerais, both Rivadavia were no less. They were instead ordered in the USA, becoming the only battleships ordered and built by the US for a foreign naval power. Propulsion: 4 Parsons turbines, 4 Yarrow boilers, 54,000 hp. and 30 knots max. Argentina was the only country in South America to order cruisers from foreign markets. Italy, more affordable than Great Britain, offered to offer a design developed from its heavy cruisers of the Trento class, particularly fast (the record at the time) at the price of their derisory protection. They were “heavy-light” cruisers, in view of their displacement, 9000 tons at full load, almost the tonnage a heavy one, and armed with 190 mm caliber, less than the 203 heavy and more than 152 mm, as on Russian cruisers. However, they complemented each other admirably with the schoolship cruiser La Argentina. Her twin, Almirante Brown, was launched the following month from the OTO Leghorn shipyard, and both will be in service in 1931. Very marine, they were not supremely fast nor well protected, nor knew the baptism of fire but were very popular within the fleet. They remained in service until 1960-61. Propulsion: 2 propellers, 2 Parsons turbines, 6 Yarrow boilers, 85,000 hp, 32 knots max. Armament: 6 x 190 mm (3×2), 12 x 100 mm, 6 x 40 mm Bofors AA, 6 TT 533 mm (2×3). The cruiser “La Argentina”, was conceived as a training ship of the Argentine Navy and a command ship at the same time, built at Vickers-Armstrong, Barrow, between 1935 and 1937, but did not started until February 1939. She was modeled after light cruisers of the Arethusa class, but modified to have three additional 152 mm guns in triple turrets. The design of her bridge was also very different, but meeting the specific requirements of La Argentina. Replacing the old tall ship Presidente Sarmiento, she was retired from service in 1974. Propulsion: 4 Parsons turbines, 4 Yarrow boilers, 54,000 hp. 30 knots max. The last destroyers in service in Argentina were La Plata and Jujuy by 1911. But their design seemed rightly exceeded with the new HMS Scott class leading flotilla in Great Britain in 1916. Spain started a series of ships inspired by the latter. Two of them, renamed Cervantes and Juan de Garray, were thus bought under construction at the Cartagena shipyard by the Argentinians. They entered into service in 1926 and 1927 and served until 1960-61. Propulsion: 2 propellers, 2 Parsons turbines, 4 Yarrow boilers, 42,000 hp and 36 knots max. Armament: 5 x 120 mm, 1 x 76 mm, 4 x 13.2 mm AA HMGs, 6 TT 533 mm (2×3). Argentina ordered three units derived from the Scott class of 1916 from the White shipyard. They were launched in 1928-1929 and were capable of bazing speed: They could normally sustain 36 knots, but at the tests they managed to reach more than 38 knots for several hours, one of them even pushing up to 39.75 knots. They were discarded only in 1962. Propulsion: 2 propellers, 2 Parsons turbines, 4 Yarrow boilers, 42,000 hp and 36 Knots. Armament: 5 x 120 mm, 1 x 76 mm, 4 x 13.2 mm MGs AA, 6 TT 533 mm (2×3). The spearhead of the Argentinian Navy, 7 destroyers ordered with the La Argentina cruiser in various British shipyards on the model of the G class in 1937. They were very effective and served until the 70s. The Corrientes was lost in 1941 because of a fatal collision. Propulsion: 2 propellers, 2 Parsons turbines, 4 Yarrow boilers, 42,000 hp, 35.5 knots. Armament: 4 x 120, 8 x 40 mm Bofors AA cannons, 8 TT 533mm (2×4). Three units built at Tosi in Italy, of the type Bernadis 600 tons, coastal submarines. Brazil replied later with the Tupi of the same type. The adoption of the order was accompanied by a “give and take” contract concerning agricultural imports by Italy, after canceling the same order placed in France, which received an order for aircraft. 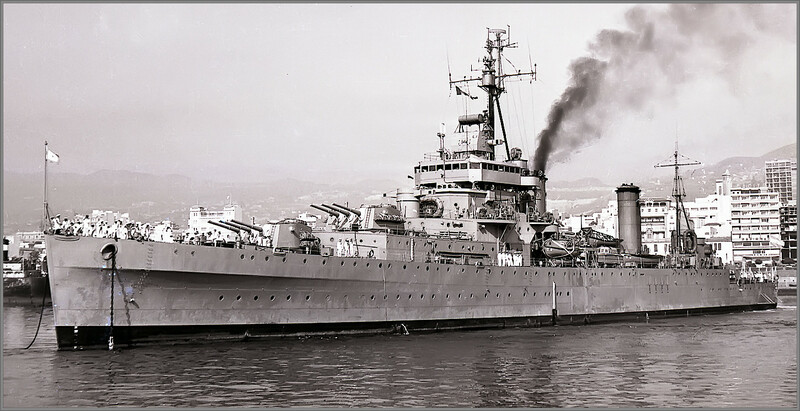 The Santa Fe, less illustrious than that attacked during the war of the Falklands, will remain in service until 1959-60. Propulsion: 2 propellers, 2 Tosi diesels, 2 electric generators 3000/1400 hp. and 17.5/9 knots max. These 9 ships were entirely designed and built in Argentina, and equipped with German MAN diesels. The Fournier was lost on an unreferenced reef in 1949, the Bouchard sold later to the Paraguayan Navy, the others being disarmed in the 60s. Propulsion: 2 propellers, 2 MAN diesels, 2000 hp 16 knots. Armament: 2 x 120 mm, 2 x 40 mm cannon Bofors AA, 2 mit. 13.2 mm AA. 2 ships that were designed in Argentina as minelayers, of four planned. Operational in 1945 and 1946, they were joined in 1955-56 by two frigates on the same hull. The King and the Murature were still operational in 1980. Propulsion: 2 propellers, 2 Werkspoor diesels, 2500 hp 18 knots. Armament: 3 x 100 mm, 4 x 40 mm Bofors AA cannons.